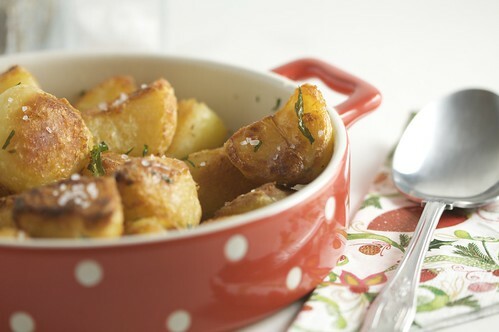 Roasties are what the English call roast potatoes. I had never heard of them till my early 20’s when I learned the following technique from my father in-law. He’s a fantastic cook. When Jim served these up, I went completely bonkers with delight or as he simply calls it-crazy Arab. A) Roughen up the edges by shaking them well. C) I really like to use duck/goose fat for flavor & vegetable oil to get them nice and crispy. Make sure the oil is hot before adding the potatoes. If you must, you can substitute with olive oil, it won’t be the end of the world. Also, spread out the potatoes in the baking tray so they are one layer. D) And of course, the type of potato is important. I like to use either Maris Piper, King Edwards or Desiree. I love the combination of tarragon with potatoes. So, these roasties have fresh tarragon added to them. You can also add whatever herb/spice you like. If using dry herbs, I recommend adding them at the very beginning and fresh herbs during the last twenty minutes. Save the skins. They are lovely baked and make great little chips/crisps. Put the potatoes into a large enough pot, cover with water, sprinkle some salt and bring to a boil. Let them boil for about 5 minutes. Spread it out evenly. Pre-heat oven to 375F/190C/5G. Place the baking tray in the oven and let the oil heat about 5 min. By now the potatoes are ready. Strain them well and return to the pot. Sprinkle generously with salt. I like my potatoes well salted. 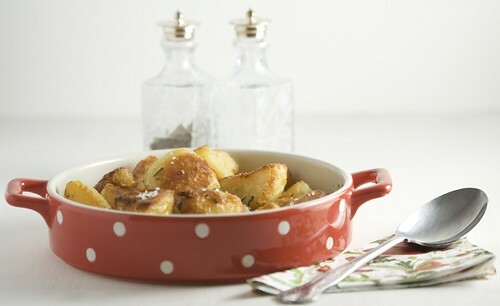 I really find potatoes and salt love each other, as much as they love my waistline! Cover the pot and give it a good shake in an upward-downward motion. Now, take the baking tray out of the oven and layer the potatoes as above. Pop into the oven for 20-25 minutes. Remove from the oven, turn them over and sprinkle with the fresh tarragon leaves. Pop back into the oven and cook for another 20-25 minutes. Wonderful recipe! My Mother-In-Law is British and I have been eating this at her home for nearly 20 years now…so simple, but so good! She makes them with shortening and lipton onion soup…but I am going to have to try your to see if I like it better. I was ill in bed all day with a cold… This was what the doctor ordered!…Thank you. I love roasties! I usually throw in some parsnips, too, if I have them. The thin ends get deliciously crunchy. Parsnips are a fantastic addition as are turnips. I’ve made a melange of them before. So delish! 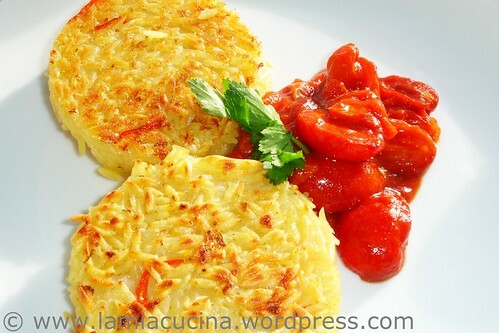 When I first saw the title of this post, i thought you were going to talk about Rösti (also golden and crispy potatoes), which i had found quite cumbersome to make..
ohhh! I feel that duck fat setting itself quite comfortably on my love handles!! who cares – you only live once gimme some of this! You crack me up Meeta. Yea we do only live once but i still ate more than my fare share of these yesterday! I really just love em. Oh yes, you have indeed worked out all the secrets!!!! Duck fat is very expensive around here, but a little indulgence now and then is permitted isn’t it???? Yes Nina, It’s nice around the holiday season. You could also use the fat from a roasted chicken etc. I love potatoes. ESPECIALLY crunch yummy browned ones. This looks so great. Thanks for the tidbit about duck fat. Finished making these a little earlier! They smell divine! Wonderful recipe! I used chicken fat, it was all I had to hand. My siblings aren’t complaning though 🙂 Thank you Beth! Oh btw, this recipe was a god-send for a novice in the kitchen like myself. The instructions were easy to follow and the pictures are very helpful! Thanks again. Thank you Zurin 🙂 I really appreciate your feedback! 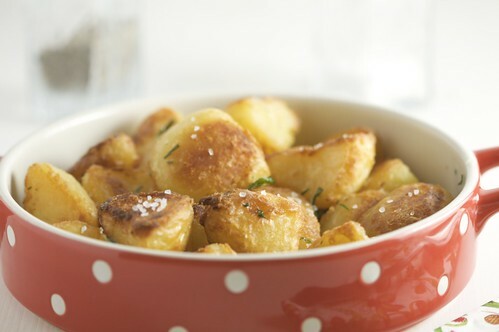 OMG these roasties are mouthwatering!! can’t wait to try this recipe!! Hi, there! I just have a little ol’ blog with only a few readers — it’s brand new. But I have been following your recipes and would love to feature you as my “blog of the moment”. I am Lebanese, too, and just LOVE your posts. Although the one that actually got my attention was the Roasties recipe. Please email me if you give me your permission to feature you, and perhaps a small blurb about who you are and what you do. Thanks!